I was in an Asian market and noticed an abundance of fresh mushrooms on display. They looked so good that I had to purchase some. I have home-made pork broth (made from pig's trotters) so I included it in this recipe. You can use store-bought broth but just remember to buy the low sodium type, this way you can control the amount of sodium or salt in your cooking. If you do not have broth you can use water. If you use water you may need to add a little more fish sauce or salt. Also depending on the types of mushrooms you use, some mushrooms give out a lot of water especially the white button mushrooms. The ones I have here in this recipe do not produce much water. If your mushrooms have high water content you may omit the broth. Here is my inspiration for these mushrooms. I served this with piping hot rice. However, you can serve this as a side dish or even over pasta. 1) Heat oil in a large wok or pan over medium high heat. 2) Once the pan is hot add garlic, saute for about a minute. 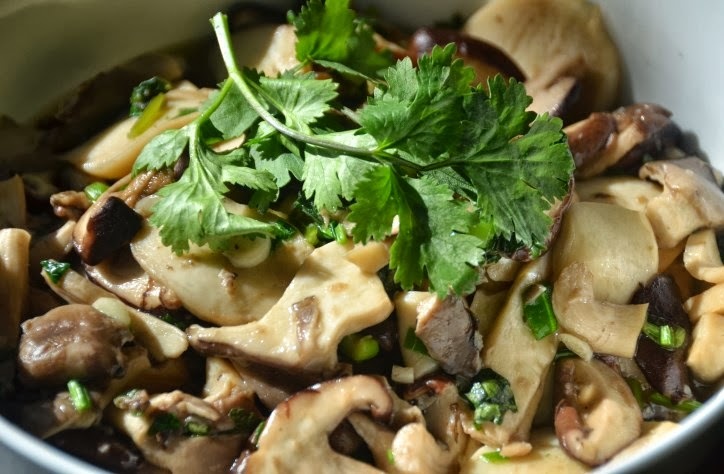 3) Add mushrooms and broth, stir a few times, cover the wok or pan for about 7 minutes. 4) Uncover the wok or pan, add scallions, cilantro, oyster sauce, fish sauce, and sugar. 6) Continue to stir and cook for another 3 minutes. *Trim each mushroom by removing and discarding the tough part of the stem. If you want to make this dish even more special you can add some of Ah Ma's Shrimp Balls to this recipe, you can add them under step 4. 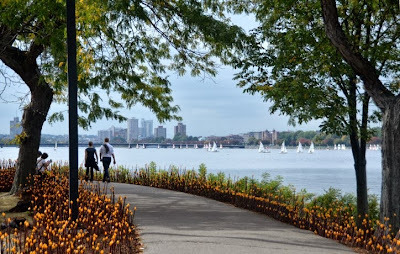 * Forest Light is on display at the Boston Esplanade until October 13, 2013.